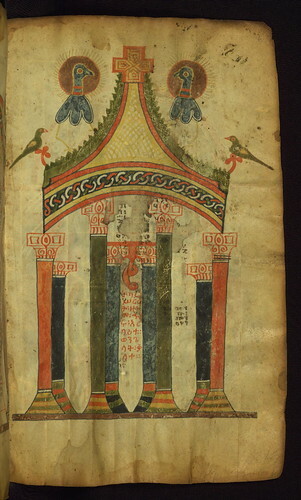 Ethiopian Gospels, Diagram showing how the Four Gospels agree in words, Walters Manuscript W.836, fol. 6r, originally uploaded by Walters Art Museum Illuminated Manuscripts. This Gospel book was written in Tǝgray, Northern Ethiopia, in the early fourteenth century, and was once owned by the church of St. George in Däbrä Mä‛ar. It is written by the scribe Mäṭre Krǝstos in the official liturgical language of Ethiopia, Gǝ‛ǝz. Most notable is its prefatory image cycle, which makes references to holy places in Jerusalem, such as Golgotha and the Holy Sepulcher, as they appeared in the sixth century. The manuscript therefore appears to be based on a sixth-century exemplar containing images connected to the Byzantine cult of holy places. Several related manuscripts have been identified that seem to be based on the same prototype, most notably Paris, Bibliotheque Nationale eth. 32, a fragment in the Institute of Ethiopian Studies, Addis Ababa University, Ethiopia, Inventory No. 3475 a-b, and another fragment in the Nationalmuseum, Stockholm, NM B 2034. The Paris manuscript contains a mid-fourteenth-century colophon which helps date the group. Although water has damaged some of its elaborately decorated pages, this Gospel Book is still an important record of the resurgence of monasticism that flourished in fourteenth-century Ethiopia. Great You can share and also recommend video clips Mobdro.uk On your system, beginning Bluestack emulator Fine.